I'm positive I'm not alone in my desire to be better organized; to have the day go more smoothly, the house be easier to keep up with and less chaotic, and to know what the heck I'm supposed to be doing each day. I'm positive of this because it's a subject my girl friends and I discuss often, but never really find a solution to (you organized Moms out there ... how do you do it?). 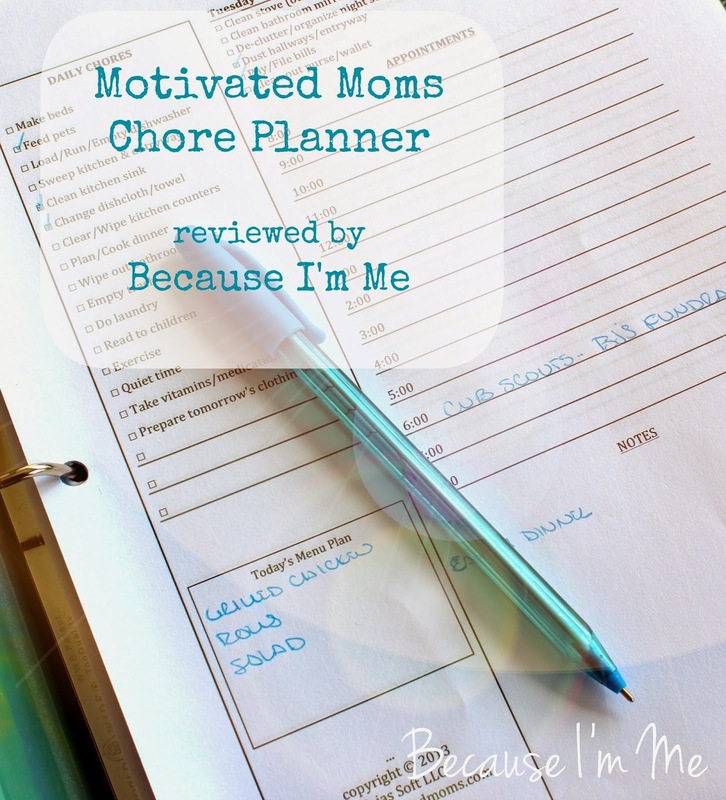 I was recently asked to review Motivated Mom's downloadable e-book yearly chore planner. An opportunity to become better organized, feel slightly less like a chicken with my head cut off, and, especially, stay on top of the housework and Mom-work? Goodness yes, I want to know more about that product! Motivated Moms offers many options for chore planners - downloadable, printable full and half page planners or chore charts, both with and without bible reading in color or black and white, and iphone/ipad apps. I chose to use an e-book full-page yearly page-per-day chore planner. First, on the left hand side of the daily page is a daily chores list, complete with check boxes to mark checked items off, and a daily menu plan box. Items on the daily chore list include making beds, cleaning the kitchen sink, do laundry, exercise, and take vitamins/medications. This list remains the same each day. Second, at the top right/center of each page is a daily cleaning and organizing list - a few items that aren't repeated every day. Clean oven, clean dishwasher door, sweep porch, clean vent hose on dryer, de-clutter night stands, clean bottom shelf of refrigerator, and clean out purse/wallet are a few of the items found in this section. Lastly, below the daily cleaning tasks is an hourly schedule of appointments, to be filled in by the user. Also included in the planner are two-week menu planning pages. Using a monthly or weekly menu plan is a great way to spend less at the store (plan your menu when the weekly ads come out, basing your menu on what's on sale), eat out less (already have dinner planned or in the crock pot), and create healthier meals for the family (no more "deer in headlights" moments when the kids ask what's for dinner, followed by scrounging for whatever is available in the refrigerator or pantry). Two things really attracted me to this chore planner: the fact that exercise is listed in the daily chores list (I know I love crossing things off my to-do list, and am more motivated to do something if it's on my list), and the rotating cleaning tasks, a great way to keep the house tidy and running smoothly without doing everything single little minute cleaning task all in one exhausting day (plus, some things like "clean toaster" would probably get done far less often than they should if they weren't on this handy list). To begin, I quickly downloaded the chore planner and printed a few months worth of pages. At one page per day I'd have used a lot of paper to print the whole year, so I opted to start with a few months, knowing I'd print more pages before too long. I opted to punch holes in the pages and stuck them in a three ring binder. If I'd printed the whole year I'd have taken it to an office supply store and had it spiral bound. Note: Lefties, you could easily print this out and put the holes on the other side of the page, making it much easier to check things off and write on the pages. Doing this didn't cross my mind until I'd already put the pages in a binder. So, is my house super clean and am I more organized? Sort of. I didn't follow the planner every day and had some trouble sticking to it, but the days I did do it I was quite pleased with it. I love the concept of dividing cleaning tasks into short little bits to do each day. Sadly, I was not more motivated to exercise every day (darn it!). I think, for me, I might have used the chore planner more if I didn't have so many different planners/apps/organizers going at once. If I'd merged this chore planner with planners for blogging, selling, home schooling, scouting, healthy eating and weight loss, etc. I'd have had everything I needed to do right in front of me at the same time. That said, I was motivated by this chore planner review to create a planner that combines most of those areas (also in a 3-ring binder). I am going to integrate the pages from this Motivated Moms weekly chore planner into the other planner and I think that'll be the ticket to success. I do know I don't want to not use the chore planner, breaking household cleaning down into little bits is wonderful, and feels so much less like work. 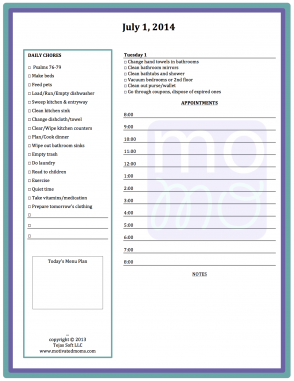 Check out the Motivated Moms weekly full-page chore planner and all the other great planner options here, and the portable device apps are found here. 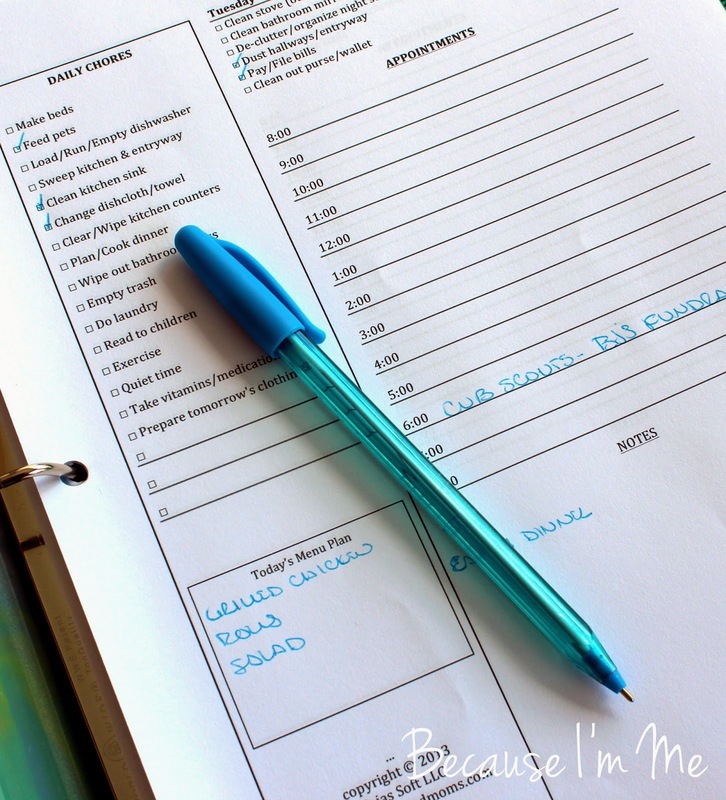 The Motivated Moms Page Per Day Chore Planner is available for just $8, and the planners are geared towards all Moms (and anyone with living space to clean and organize).